It's a pub conversation had many times; who'd be in the ultimate supergroup? Most real life attempts have failed to reach the heights the collective talent merits. CSNY? Live, and in their heyday, certainly. But nothing on Deja Vu would displace a song from "Tonight's The Night" or "On The Beach". Cream? Yes, but given the artistic output of the individual members post-Cream, I'd question the 'super-ness'. Temple Of The Dog? Don't really count as they only really became a supergroup in retrospect. At the time, Pearl Jam hadn't yet broken and Soundgarden hadn't fully scaled the heights they would go on to do. The Travelling Wilbury's? The ultimate in star power, but seriously with this much talent, did anything that they produced even approach the back catalogue work of these behemoths? Given all that here's my attempt at the ultimate supergroup line up. I figured there were 3 ways to do this. 3. Try to create a balanced line up that might actually work in real life. Approach 1 would naturally bias toward modern players as teaching methods and equipment, in addition to the general level of technique have got higher. Approach 2 is the easiest by far. Approach 3 seems almost impossible given what a fickle beast band chemistry is. Naturally I'm going with approach 2, and I'll attempt a light sprinkling of 3. If you did a poll of rock fans I would imagine the John Bonham would win this slot by a landslide. 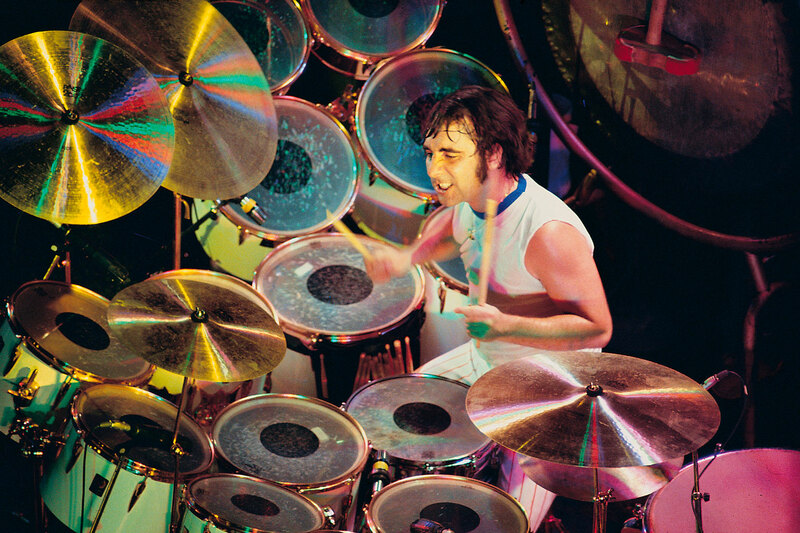 However my pick is another legendary wild man, Keith Moon. Was he a technically 'correct' drummer, no. Did he play 'correctly', no. Did he constantly overplay trying to grab the lime light? Absolutely. But, oh what playing. The energy, the power, the inventiveness. By far my favourite drummer to listen to, he sounds like every 8 year old's dream of the Muppet's Animal brought to life. It won't be dull with Moon manning the drum stool.